In the midst of a holiday or vacation, the first thing that is trying to do is to transfer iPhone photos and videos to the iPhone to make room for the new memories. We could rely on iTunes but we know how much Apple’s software in these operations, as compatible as with their products, turns out to be complicated and rudimentary. MacX MediaTrans is a great alternative that simplifies and speeds up this operation and thanks to the currently available Giveaway, you can get a free license. 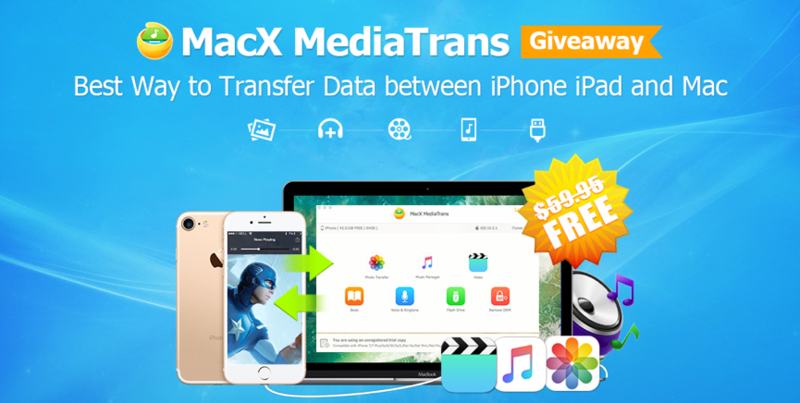 Coming back to us, MacX MediaTrans is a software that allows you to transfer your iPhone and iPad data to your Mac at a glance. It can transfer photos, music, videos, books, voice memos, podcasts, iTunes U and more (here’s the user guide). It also allows you to add, remove and create ringtones or playlists, convert audio and video files to iOS (MP4-compatible for video and MP3 music), or convert iPhone and iPad to external hard drives to store any other kind of free memory files available. It also works as a file manager allowing you to clean the photo roll in one click. The software is installed with the usual drag & drop of the app in the Mac Applications folder. At startup, it shows a simple screen with some quick buttons to reach the Settings or access the Photo, Music, Video and Flash Drive panels, thus managing quickly synchronize by file type. For example, with the Photos panel, you can quickly back up all the photos in your phone, making sure you do not lose them (or just keep a copy on your computer). The transfer is very fast, in about 8 seconds, approximately 100 photographs with 4K resolution are transferred. The Music panel finally forgets the tangled song sync system through iTunes. Just drag the folders or singles songs to see them immediately transferred to your phone. Similarly, one or more songs on your smartphone can be restored to your computer, as well as managing your computer tags and playlists. Similar features are also guaranteed with the Video panel, where you can drag and drop all the movies you want to see them automatically converted from the system to the correct format and then stored in the phone. Here too, in the same way, you can export all the videos already contained on your smartphone to your computer. An interesting grace is the Flash Drive panel, which basically turns iPhone and iPad into a USB stick. This is one of the best software for transferring multimedia files from iPhone to Mac. For this reason, those who are interested would like to take advantage of the currently active giveaway, both as regards the possibility of obtaining MacX Mediatrans license free .